Toronto, ON – Strategy and collaboration are key to implementing a digital workplace, Gartner analyst Bob Hafner said during a presentation at the 2016 Gartner CIO & IT Executive Summit on June 16. Rather than simply assigning a vaguely defined tech-related project to the IT department, the C-suite needs to develop a concrete strategy involving multiple departments working together, with someone – ideally the CIO – taking the lead, he said. Gartner analyst Bob Hafner says it’s important for companies to develop a concrete, collaborative strategy when implementing a digital workplace. “Right now the biggest obstacle most companies face in implementing a digital workplace is they haven’t built a strategy, and they don’t have somebody responsible for it, because it spans so many departments,” said Hafner, who serves as managing vice president of Gartner Research’s mobile and wireless division. Far from being limited to IT, Hafner said, implementing a digital workplace has a profound impact on – and needs to include input from – departments such as HR, communications, and marketing. Each of these priorities would receive a boost after implementing a digital workplace, Hafner said, with new platforms, customer-centric online services, and process efficiencies driving growth, and remote work optimization and analytics improving workforce retention. But too many companies still aren’t taking advantage, he said. Fortunately for those members of the C-suite still developing a digital implementation strategy – and the CIOs supporting them – Hafner offered a few guidelines to push them along. One of the most important elements of implementing a digital workplace is to think of the employer/employee relationship from both sides, Hafner said, using a composite employee named “Carlos” to illustrate his lesson. Hafner’s hypothetical company expected a great deal from Carlos, he said: availability 18/7; the ability to provide leadership and mentoring, collaborate with teams across far-flung distances, and make autonomous decisions along the way; brand support at both home and work; and a willingness to change roles and groups, to name a few. However, to get the best support available from Carlos the company needed to recognize his needs too, Hafner said, which included easy access to best-in-class hardware, apps, and content; the freedom to perform certain personal tasks at work; a wide range of collaboration tools, including a supportive IT department; and personal analytics that could identify what he did well and what he could improve. The leader of a digital implementation strategy would do well to give the needs of both Carlos and the company equal weight, Hafner said. Otherwise, the company risks Carlos striking out for greener pastures. Without a digital workplace there is little collaboration between enterprise departments, Hafner admitted, because few see the need for it. With the digital workplace that changes, he said: Successful implementation requires companies to combine projects from across departments with the right IT skills, and this mix should be top of mind as CIOs consider the digital infrastructure they plan to install in each department. 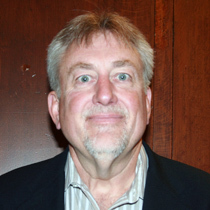 Hafner illustrated his lesson using another case study, which developed profiles for nine employees and evaluated their strengths and weaknesses to ensure they collaborated well in groups. 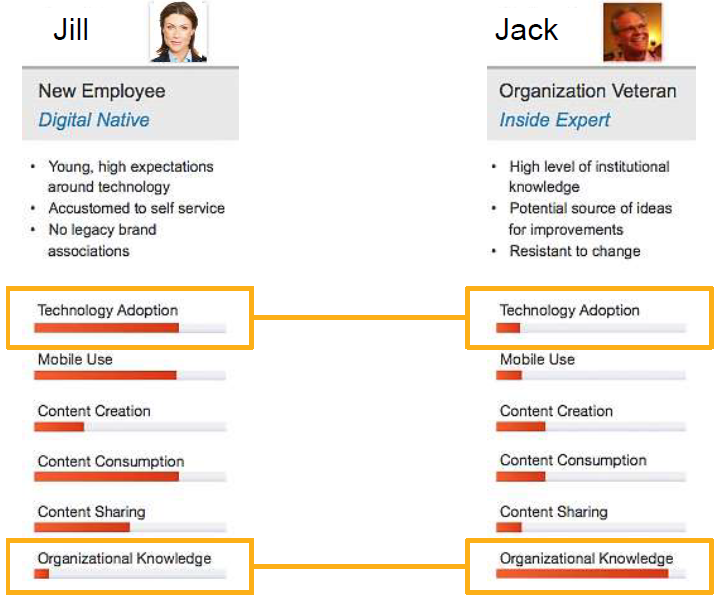 Note that in this example, “Jill” has high technology adoption, mobile use, and content consumption, but low organizational knowledge, while “Jack” is more change resistant and doesn’t use the same type of content, or as often. But his organizational knowledge is high. To build workplace technology that people will use, Hafner said, you need to approach it like consumer technology. Developers of consumer technology prize intuitiveness above all, he said – after all, nobody reads user guides anymore. Like them, architects of the digital workplace – including CIOs – need to think about making the user adoption process intuitive, ensuring colleagues can use their new technology without a two- or three-month training period. In one of his slides Hafner shared an anonymous organization’s near-term goals, which included the consolidation of multiple technology platforms; the development of electronic user profiles; enhanced mobile and wireless infrastructure; and integrated services. “These are all things that make sense to everybody, but we’re not really doing a whole lot about them,” he said. Instead, he said, organizations would do well to set realistic goals, giving priority to “quick wins” that can be showcased as success stories. Too many CIOs plan only for the present, Hafner cautioned as he shared the results of a Gartner CIO survey (below) that discovered only 13 per cent of respondents were planning between three and five years ahead – a crucial period, he noted, because IT strategies take time to plan and implement. And it’s the best-planned strategies that are most likely to succeed, he said.